Bangalore, January 12, 2019 : Aimed to spread the message of ‘BE GOOD – DO GOOD’ on the occasion of the 155th birth anniversary of Swami Vivekananda, a mega youth campaign VIVEK BAND-2019 has been organized by Samartha Bharata trust, an organization promoting social volunteering among youth. The Campaign to begin on January 12, 2019 and to conclude on January 26, 2019. At RV Teachers’ College, Bengaluru, an event was organised where the Vivek Band was launched. Prof K R Venugopal VC of the BU, Dr. Krishnaiah, Principal of the RV Teachers’ college, Cine artiste Smt. Tara Anuradha attended the event. Dr. Jayaprakash, Deputy Director of Dept of Animal Husbandry and Veternary Sciences delivered the talk on the occassion. Samartha Bharata trustee Sri Rajesh Padmar was also present. The campaign starts with the wearing of a wrist band carrying the message ‘BE GOOD – DO GOOD’ on January 12th, 2019, to commemorate the 155th birthday of Swami Vivekananda, which is celebrated as National Youth Day, and lasts for 2 weeks till January 26th, 2019. 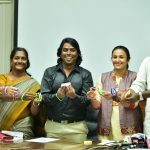 “Vivek Band Campaign aims to reach more than 6 lakh youth and students and let the message serve as a reminder of the immense potential and opportunities that the youth have, to transform their lives and to pledge to build a strong, healthy society. This is the 5th year such a campaign by Samartha Bharata has been organising and successfully running in the state.